The Decatur Police Department has the authority and responsibility to enforce and investigate all local and state laws within the City. The Decatur Police Department responds to calls by assigned neighborhood zone. The Decatur Police Department offers a real-time, electronic community crime mapping for public viewing. Powered by Lexis Nexis software, community crime mapping provides crime reporting from throughout the city. All crime data is subject to change based upon investigative outcomes and may be subject to a seven-day lag. "I just want to thank you guys for the amazingly quick response you had to my 911 call yesterday regarding a possible home invasion. Thankfully it ended up being a false alarm. But Decatur PD showing up within one minute of my call sure made me feel good. I now know how quickly you guys are there when we need you. Thanks again." 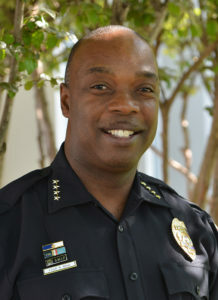 - Tara C.
"We have had multiple interactions with Detective Sparks for several years and he has always exhibited the upmost professionalism. He has always been on top of things and is a true testament to the Decatur Police Department. " - Michael A. "We are grateful for the fine work of Officer Wellman and Officer Franklin. My mother, who has Alzheimer's, walked out the front door. These officers found her. We are so thankful!" -Angela P.
"Someone broke the glass front door to our property last night with a rock from the railroad tracks. The police were wonderful. Policeman Justice was really great." "My daughter and I feel the two officers involved in a difficult traffic stop yesterday on the Beltline should be commended. We watched them maintain their composure while the driver acted agitated and hostile. Whoever those gentlemen were, they handled themselves so well." - Laura F.
"My grandson saw one of your officers next to my house on Easter and wanted to take him an Easter egg with candy. The officer kindly gave him a stuffed bunny rabbit. My grandson is over the moon and has named his bunny Officer Rabbit." - Bonnie L.
“A big thank you to Officer Bates and Officer Bankhead. Driving home from work, I had a blowout on 6th Avenue and was able to make it to Mapco. At almost midnight, I had no one to call. They were there and got my spare tire put on my car for me. Let them know they are much appreciated." - Michelle W.
"I wanted to say that I appreciate Det. Michael Kitchens. Today, my mom had a car accident at Gordon Terry and McEntire Lane, and Det. Kitchens pulled up to the wreck right after it happened to make sure everyone was okay and to control traffic, until the officer working the wreck showed up.” - Jared T.
"We woke up yesterday and took our dogs out in our back yard, at which time we could hear a lot of yelling coming from the direction of the front of our house. We went inside and could see through our kitchen window that DPD was already on the scene -- the person who had been previously yelling was quieted down." - Candace B. “BIG shout out to the cops who helped me tonight on Danville Road when my transmission blew. The first cop who showed up was so helpful and understanding. I would love to thank him again personally.” - Lindsey C.
“I just wanted to brag on your officers for being a positive influence to our students.” - Alicia M.
“I would like to thank the Decatur Police Department. My wife had a wreck on the Beltline in front of Lowe’s. The officers there did their jobs very professionally and were courteous. Thanks to Officer Edmonson everything went smoothly. Thanks again!” - Tom C.
Don't miss out on this Wednesday event! REMINDER -- ROAD CLOSURE TOMORROW: Weather permitting, the Street Department will replace drainage pipe on Stratford Road SE, just west of Palmetto Drive, beginning tomorrow.